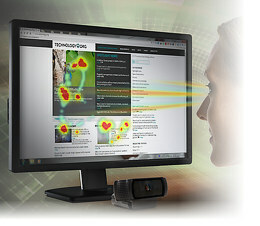 SentiGaze enables the use of ordinary webcams for sophisticated eye movement tracking and analysis through generation of heatmaps that can gauge the effectiveness of website or online advertising content. Vilnius, Lithuania – March 2, 2015 – Neurotechnology, a provider of high-precision biometric, robotics and AI technologies, today introduced the SentiGaze Software Development Kit (SDK). The SentiGaze algorithm enables designers and developers to create applications that use off-the-shelf webcams to track eye movements and generate heatmaps based on how a user gazes at a monitor. Heatmaps can be used for applications such as analysis of websites or determining the effectiveness of online advertising. The SDK can also be used to develop interfaces for a number of other gaze-aware applications, including games and software that provides disabled people with some assistance in controlling their computers. Tracking of eye movements and generation of heatmaps have been in use for a number of years in laboratories and high-end web design and marketing firms for the analysis of website effectiveness, reactions to advertising and for usability improvement in software design. However, eye tracking technologies usually require specialized hardware and user environments, which limits the number and scale of potential applications for this useful technology. With SentiGaze, designers and developers can create sophisticated eye tracking applications and solutions that can be deployed simply by downloading and installing it in any office or home environment using an ordinary webcam mounted below a computer monitor. When the webcam is directed at a user's face, SentiGaze captures binocular eye data to track the user's gaze. The SDK includes tools for gaze heatmap generation, such as live preview of gaze heatmaps, gaze heatmap generation on images or videos and multiuser gaze heatmap generation. It supports screen sizes up to 61 cm (24 in) and has an operating range of 45 - 80 cm (18 - 32 in) with an optimal range of 60 cm (24 in). SentiGaze SDK includes support for C, C++ and C# programming languages. "With SentiGaze SDK, you can use ordinary web cameras to really see and track where people are looking," said Arturas Nakvosas, SentiGaze project lead for Neurotechnology. "The SDK is a flexible development tool that enables developers to create new eye-tracking applications or to easily integrate the SentiGaze technology into existing applications and solutions." For more complex analysis, SentiGaze SDK can be used in the combination with the VeriLook SDK for facial recognition. VeriLook SDK, also from Neurotechnology, can be used for a number of purposes, including recognition of a person who is using an application and determining a user's gender or emotion. This allows developers to build applications that do more advanced analysis of collected eye-gazing data - particularly when data from multiple users is collected. For example, an application could use SentiGaze and VeriLook together to analyze the statistical distribution of gender to determine if a particular advertisement attracts more women or men. SentiGaze SDK is the latest offering in Neurotechnology's "Senti" line of AI and robotics products, including SentiSculpt SDK for creation of 3D object models from 2D camera images, SentiSight SDK for development of computer and robotic vision applications and the SentiBotics mobile robotics development kit. SentiGaze SDK and the entire line of Neurotechnology products for AI, robotics, object recognition and biometric identification are available through Neurotechnology or from distributors worldwide. For more information, go to www.neurotechnology.com.